Shares of the sportswear brand tumbled on weak guidance at the company's investor conference. 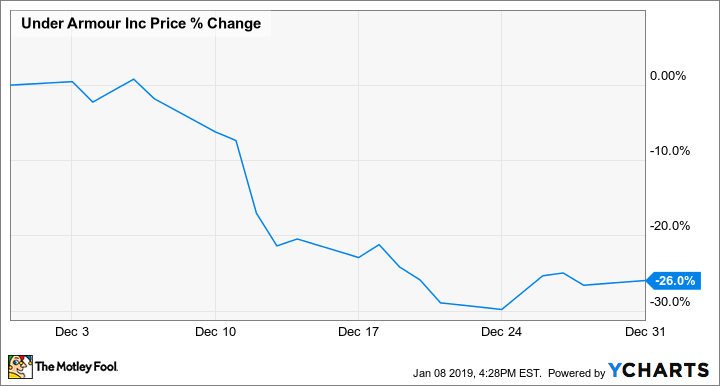 Shares of Under Armour (NYSE:UAA) (NYSE:UA) were coming up short again last month after the sportswear company issued weak guidance at its Investor Day conference on Dec. 12. The news prompted the stock to fall 26% for December, according to data from S&P Global Market Intelligence. As you can see from the chart below, the bulk of those losses came from the Investor Day update, but the stock was also pressured by broader market weakness. Under Armour stock started to crash in 2016 when the company was forced to back away from ambitious targets it gave at its 2015 Investor Day conference, and some investors may have been experiencing deja vu this time around. The sportswear specialist, which was regularly growing sales by more than 20% earlier in the decade, said it expected a compound annual growth rate in just the mid to high single digits over the next five years, primarily driven by its international and direct-to-consumer segments. Management projected a return to low double-digit growth by 2023 as its international business will make up a greater percentage of sales by then. But the forecast confirms that the company will continue to struggle in North America, its home market. Its 2019 forecast was also underwhelming as Under Armour said revenue would grow just 3% to 4%, and it called for earnings per share of $0.31 to $0.33, below analyst estimates at $0.35. Under Armour did project EPS growing by a compound annual rate of 40% over the next five years, but that's partly because EPS has fallen by more than half since 2015 as the company's business has collapsed. That guidance translates into EPS around $1.15 by 2023. Under Armour's business never really recovered from the bankruptcy of sporting goods retailers like The Sports Authority and others, and its brand seems to be poorly positioned for current fashion tastes. Consumers have favored vintage styles like Adidas Superstar shoes and are generally avoiding performance sportswear, which is Under Armour's focus. Though the company would like to make the transition to a fashion/streetwear brand more like Adidas and Nike, it has struggled to do so. The latest guidance confirms that there will be no easy recovery from Under Armour's recent woes. Check out the latest Under Armour earnings call transcript.